Santa Barbara, Calif. – June 30th, 2016 – Anasys Instruments, the world leader in nanoscale IR spectroscopy, reports on a new breakthrough technique for AFM-IR developed by researchers at Changchun Institute of Applied Chemistry, China, that for the first time provides quantification of chemical concentrations of polymer nanodomains with direct correlation to conventional FTIR. This new technique, specifically developed for AFM-IR, establishes a quantitative analysis method which analyzes polyethylene content in nanoscopic domains of rubber particles dispersed within a polypropylene matrix. 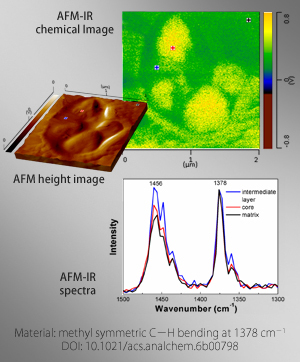 This new quantitative AFM-IR method will offer a practical method for assessing compositions of nanoscale domains in complex polymeric materials. The technique and results are published in full in Analytical Chemistry, and was a joint paper with State Key Laboratory of Polymer Physics and Chemistry, Changchun Institute of Applied Chemistry, Chinese Academy of Sciences, the University of Chinese Academy of Sciences, and ExxonMobil Asia Pacific R&D., Ltd., China. You can access the details of the paper here.